Confucious say woman running to catch a train sometimes falls down the stairs instead* - Laughs! Thrills! Pathos! In an uncharacteristic bout of trend-setting I managed to do in the ligaments of my left-leg just before the snows and have since been fighting for priority seats on public transport with a seasonal drove of other crippled ones. This only reinforces my earlier suspicions that I am not made for running and that no good comes of it. Now that the running question is settled I continue to learn the distinction between determination and stupidity in other areas of my life, as a combination of my Socialist work-ethic and my employer's disinclination to give me sick pay mean that I am daily continuing to wheeze, hobble and cough to South London and back to the despair of my immune system and the horror and pity of my colleagues. On the other hand, thanks to all that crutching around is doing wonders for my upper body strength. I may get those taut biceps yet! Like a Communist-block car my body is equal parts thing of wonder and shoddy workmanship. It runs perpetually on a quarter tank of gas, and makes alarming noises while flashing random warning lights, but it runs despite all the odds and keeps on running. At last count my most recent wretchednesses include: orthostatic hypotension, asthma, arthritis, cystitis, sinus, throat and chest infections, achilles tendonitis, plantar fasciitis, and rip of the anteriror left ankle ligaments. Or, in the words of my loving spouse (who is not merely content with calling me Tiny Tim): "Wow, an ENT wouldn't even start addressing all your ills; they should invent a new medical specialty just for people like you".On the other hand since I have got significantly more mileage out of the "in sickness and in health" aspect of our marriage over the last 7 years I may have the last laugh yet. When not absconding with my crutches (or MIIIIINE crutches as my daughter calls them with a possessive gleam in her eye), the children have been attempting to be helpful. Helena likes to pat me on the head and go: "Okay, Mommy?" while Matei prefers to follow me around with his new favourite book** in an effort to better understand my broken self. 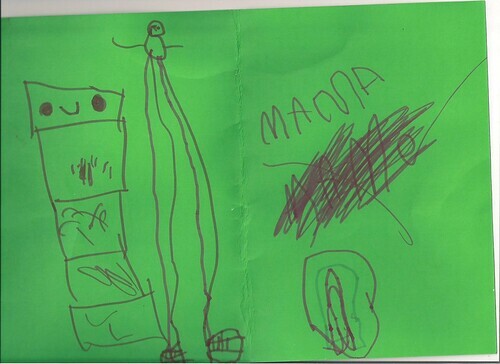 He has also presented me with a thoughtful drawing of what he believes is happening inside my asthmatic lungs***, as well as this get-well card which depicts myself, a caterpillar and a rainbow (and not as I first thought the anatomically correct drawing of a lady's special area). *I am seriously considering inventing a better story. Something about derring-do and tigers and bears and fire. ** The book singlehandedly responsible for Matei's newfound passion for biology and the twitch I have started to develop when asked to read about the circulatory system for as many times a day as he can bully me into it. *** He presented it to me with a flourish, and the words: "I have been thinking about you." I thought the vivid green in which he had rendered the mucus was an especially nice touch.